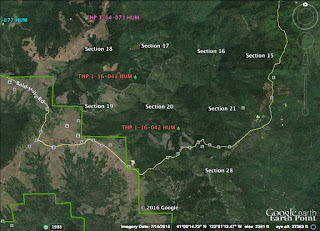 THPBlog: Green Diamond Resource Company planning a pair of clearcut THPs east of Redwood National Park. Green Diamond Resource Company planning a pair of clearcut THPs east of Redwood National Park. This THP is about 15 miles NE of Trinidad, CA and about 6 miles SW of Weitchpec, CA along the eastern boundary of Redwood National Park. Green Diamond Resource Company is planning a mostly clearcut tractor and cable logging operation on steep and unstable slopes in Douglas fir forests at an elevation of 1,710 to 2,890 feet. The THP area flows into the Klamath River which is listed as an impaired watershed for sediment, temperature, nutrients and dissolved oxygen. There are 22 landslide terrain/road failure sites within the THP area related to watercourses and roads including cut bank, fill slope, debris slides, earth flows, rock slides and disrupted ground. Green Diamond Resource Company is planning to re-construct 3 segments of existing roads across unstable areas, and re-construct 2 segments of existing roads on slopes over 20% grade within units I and J. They also want to re-construct an existing short segment of road inside unit G that exceeds 35% grade within 90 feet of a class II (mid-sized) watercourse. 65 road drainage sites are planned for work including rocking, dip construction, ditch cleaning, culvert repair/replacement and restoration of washed out crossings (sink holes, bank sloughing, road bed channeling, bank sloughing, etc). Golden eagles have been sighted within .5 mi of the THP area, and tailed frogs are known to occur immediately adjacent to unit A. There are spotted owl nesting territories within .5 mi of units E and G. This THP is just north of Green Diamond Resource Company’s recently proposed “Tully Green” THP 1-16-042 HUM. This THP is about 14 miles NE of Trinidad, CA and about 6 miles SW of Weitchpec, CA along the eastern boundary of Redwood National Park (Unit A is adjacent). Green Diamond Resource Company is planning a mostly clearcut tractor and cable logging operation on steep and unstable slopes in redwood and Douglas fir forests at an elevation of 1,700 to 3,200 feet. The THP area flows into the Klamath River which is listed as an impaired watershed for sediment, temperature, nutrients and dissolved oxygen. There are 6 landslide terrain sites including 4 unstable areas in unit C, 1 unstable area in unit D, 1 large unstable area with smaller unstable areas in unit G, and 5 road failure sites including cut bank failures, fill failures, road bed slumping and road bed channeling. Green Diamond Resource Company is planning to re-construct a section of existing seasonal road across an unstable area in unit G. 41 road drainage sites are planned for work including rocking, dip construction, ditch cleaning, culvert repair/replacement and restoration of washed out crossings (sink holes, bank sloughing, road bed channeling, bank sloughing, etc). A Sonoma tree vole was reported to be in unit G during a 2001 survey, golden eagles have been sighted 1.3 miles NW of the THP area, and tailed frogs are known to occur immediately adjacent to unit A. There are spotted owl nesting territories within .5 mi of unit I. This THP is just south of Green Diamond Resource Company’s recently proposed “Robber's Gulch” THP 1-16-041 HUM.